Each year for Women’s History Month, The Metropolitan Museum of Art celebrates women leaders from a variety of sectors through its Multicultural Audience Development Initiative. 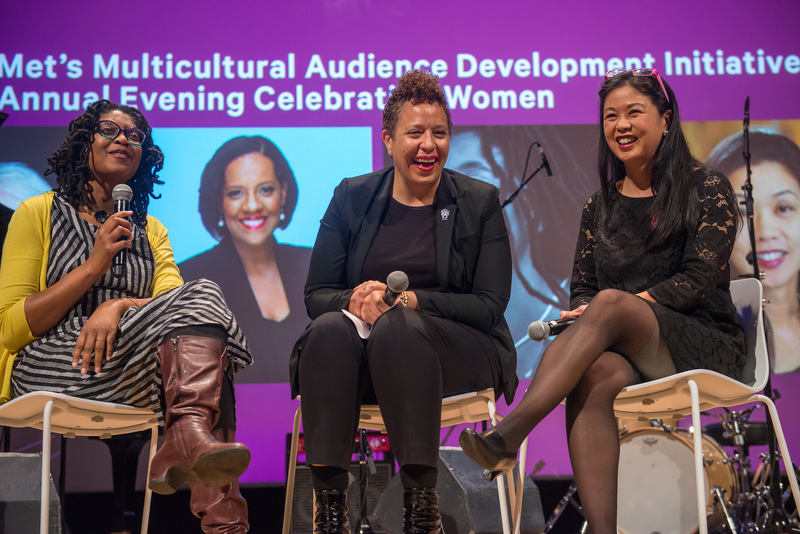 On Friday, April 7, 2017, The Met’s Multicultural Audience Development Initiative honored The LP’s Executive Director, Kemi Ilesanmi, alongside New York City Schools Chancellor Carmen Fariña, New York City Council Member Julissa Ferreras-Copeland, and Andrea Louie, Executive Director of The Asian American Arts Alliance, at its 11th Annual Evening Celebrating Women. This public event celebrated these four remarkable women, who are making a difference in the arts, education, and government, through an evening of conversation and a live performance tribute from the talented Jazzmeia Horn, Winner of the 2015 Thelonious Monk International Vocal Jazz Competition. The performance was also a tribute to the 2017 centennial of legendary jazz vocalists Lena Horne and Ella Fitzgerald. 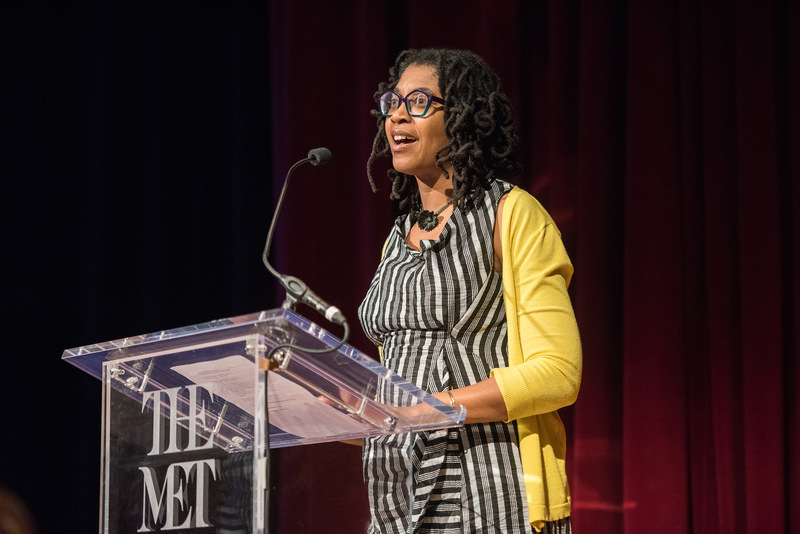 Sandra D. Jackson-Dumont, Frederick P. and Sandra P. Rose Chairman of Education at The Met, hosted the evening’s ceremonies and closing conversation. “Sandra, thank you for your kind words. You are among the women that I most admire so this is especially thrilling. I’m so humbled to receive this honor from The Met’s Multicultural Audience Development Initiative’s Annual Women’s History Month Celebration! And what incredible co-honorees I get to share the stage with today. This is truly special. In this political moment that we find ourselves in, I keep asking, How can we be as Black and Brown people, as people of color, as women, as LGBTQ folk, as immigrants, as artists and art lovers. How can we be well as our full, whole, and intersectional selves? Since this is a night celebrating women, I want to name some of the women that have helped make me whole and well. I must start with my grandmothers, Florence Ilesanmi and Cora Elizabeth Myles. Born on 2 different continents, Africa and North America, they never met, but they were united in the commitment to their children’s dreams and their children’s children’s dream. Standing here today, I know that I embody their wildest dreams. Next, I must thank my mother and my sister, Clarie and Tola Ilesanmi. Along with me, they have lived on both of the continents I just named. And most importantly, they have been my greatest champions throughout my life. And because I believe in chosen family as well as blood, I want to acknowledge, the many women who have invested in my whole being and showed me a way forward as mentors and champions: Dr. Kellie Jones, Dr. Deborah Willis, Kathy Halbreich, Ruby Lerner, and Elizabeth Alexander, to name just a few. I believe it is just as important to build a peer network as one embarks on a professional path so I especially want to acknowledge the many women EDs that I love and in particular, 6 amazing women who support me, challenge me, and teach me everyday as our own “Sustainable Sisterhood.” These women are my rock. It is also key to pay it forward by mentoring those coming up behind us. I am especially inspired by my team at The LP: Ayesha, Yvette, Alicia, Melissa, and Emily (and Hatuey too, of course!). I also want to acknowledge my step-daughter Anna Poe-Kest and the organization she has started with other young women in politics and government: The Broad Room. I am so inspired! As Dr. Brittney Cooper articulated in her recent TED Talk, we are shaping the world everyday as women, people of color, etc. We move the world forward as actors in the course of human history. We cannot afford to forget this. In fact, in this moment, it is key to remember that we have that power, and that we deserve to be well and to be whole. I am reminded of how this power manifests in the work that I do everyday at The Laundromat Project. The LP, for short, was founded by another amazing woman in my orbit: Rise Wilson. Our mission is to equip and embolden artists and our collective neighbors as creative change agents in our own communities. We believe in the power of art, imagination, community, and social change. We are rooted in an incredible network of POC artists, NYC communities, and the culture we make and stories we tell. As Angela Davis said at a Groundswell event last night, another organization run by a fab woman: Robyne Walker Murphy, “there can’t be radical social change without artists. Artists can grasp complexities before we have the language to explain.” I live that in the work I get to do with The LP and for that I am grateful. So, once again, thank so much to all the incredible women in my life. Thank you to the The Met for this wonderful honor celebrating the diverse power and beauty of women. I have to acknowledge my cousins, the Gacheguas, visiting from London this week. And finally, thank you to one man, my wonderful husband Steve Kest. May we be well. May we be whole.